Register now for NCBP Annual Meeting – Time is Running Out! Want to be a game changer for your bar? 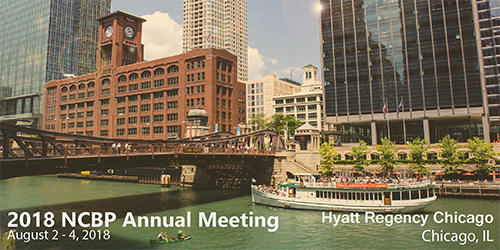 Then don't miss your chance to join the National Conference of Bar Presidents at our 2018 Annual Meeting, August 2-4, 2018 in Chicago, IL! This meeting will feature an NCBP/ABA Joint Forum featuring ABA Deputy Attorney General Rod Rosenstein; plenaries on Game Changers in Leadership, Innovation and Collaboration, as well as Changing the Game in Access to Justice; an interview with noted attorney and civil rights activist Fred Gray; workshops; roundtable discussions; and plenty of networking time with fellow bar leaders from around the country! See a program preview here. Be informed. Be a Game Changer. Be in Chicago. Understanding Workplace Experiences of Legal Professionals: Project Survey...The American Bar Association is partnering with the Burton Blatt Institute at Syracuse University on this study to examine the opportunities and challenges facing individuals in the legal profession of the 21st century, with consideration of women, minorities, people of differing sexual orientations and gender identities, people with disabilities, and others. The 15-minute survey is anonymous and voluntary. It is approved by the Syracuse University Human Subjects Review Board. The findings will be used to help develop best practices in the legal profession. Women’s Bar Association of Massachusetts Releases Survey of Workplace Conduct and Behaviors at Law Firms...In the wake of #MeToo and the enormous focus on workplace behaviors that profoundly impact careers, the Women’s Bar Association of Massachusetts, in partnership with the Rikleen Institute for Strategic Leadership, announces the results of its groundbreaking survey: Survey of Workplace Conduct and Behaviors in Law Firms. The survey was created to: provide a better understanding of behaviors taking place in the law firm work environment; identify steps taken to address behaviors of concern; and offer recommendations that leaders can implement to ensure workplaces that feel safe, respectful and inclusive. While the study included only individuals who work or have worked at law firms in Massachusetts, the lessons learned from the survey have broad-based applicability across work sectors and localities. One key, but not so surprising, finding: unchecked power imbalance serves as the foundation for and perpetuates negative and inappropriate behaviors in the workplace. Read the survey here. The problem with law schools is they only prepare future lawyers...Working in today’s legal market requires more skill than just knowing the law, but not all law schools have matched their curriculum to this changing marketplace. Read More in Legal Tech News.